Bulging discs, also known as slipped discs or protruding discs, are a relatively common injury. They may occur anywhere in the spinal column: in your lumbar spine, thoracic spine or cervical spine (neck). Herniated or prolapsed discs are slightly more serious and involve the outer part of the disc rupturing and the inner material (nucleus pulposis) seeping out. As you might expect, a herniated or bulging disc in the lumbar spine can put pressure on the spinal cord and cause muscle spasms, cramps, numbness and considerable pain in the neck, back or legs. the prevention of ongoing disc degeneration by restoring normal pelvic and spinal alignment. 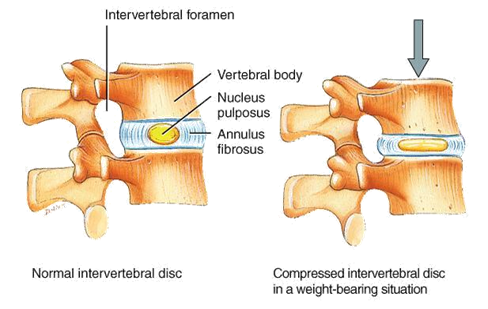 The diagram below illustrates where these are located within vertebrae, and the effects of compression on the disc. The nucleus pulposus is the fluid-like component. If you like, you can think of it as a jelly-like or caramel-like part that sits inside a chocolate. It moves the outside of the disc around, depending on the pressures placed on your spine. The annulus fibrosus is the strong outer layer that makes up the outside portion of the disc. It’s made of multi-directional fibrocartilaginous fibres that are densely packed to create a shell-like wall around the nucleus. Its job is to contain and protect the nucleus pulposus and to flex and cushion the vertebra as the spine moves. Interestingly, sometimes people can suffer a herniated disc with no symptoms or pain. It depends, amongst other things, on where the injury is in the spine and whether the bulging nucleus presses against nerves. 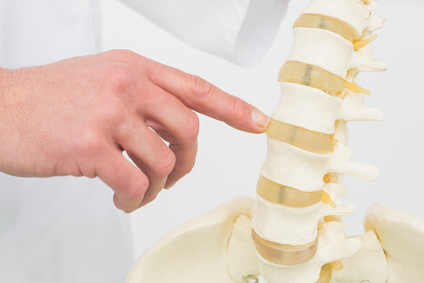 What causes a bulging disc or herniated disc? Sudden, unexpected loads experienced in extreme circumstances, such as motor vehicle accidents or falls can cause disc injuries. Occasionally, these injuries can also be caused by heavy lifting, particularly when there is twisting involved. In such instances, the annulus fibrosus may tear and cause an injury such as a herniated disc. There is a genetic component to disc injuries. Some individuals have fewer and less dense elastic fibres. Consequently, they are more predisposed to discal injury. Repeated microtraumas (small traumas) over an extended period, may lead to discal injury. Examples of this include poor posture while sitting, repeated bending or while performing athletic or other repetitive movements. If, for example, a gardener repeatedly bends to weed or dig without proper abdominal muscle support, disc issues can arise. If you experience severe back pain or pain in the buttocks or legs, it is recommended that you first see your doctor or physiotherapist. If, after assessing your history and current physical presentation, a herniated disc is likely, your practitioner will most likely send you for an MRI or CT scan, both of which give the most accurate diagnosis of discal injuries. Surgery is rarely recommended for those with a minor bulging disc or even a herniated disc. Instead, the patient is encouraged to stay in neutral postural position and avoid vigorous or damaging activity so that the torn fibres of the annulus fibrosus can heal and the disc bulge can reduce and return to normal. By staying in a mostly neutral spine position (without bending and twisting) the body can grow scar tissue to protect the area – a process which takes approximately six weeks. Therefore, it is imperative to avoid aggravating postural positions in this time and to do only gentle exercise. Below are some guidelines for massage treatment during the main phases of recovery after a disc injury. During the acute phase – the recommended treatment is ice, and NSAIDS (nonsteroidal anti-inflammatory drugs). Massage is not advised until the pain and inflammation have decreased. During the sub-acute phase – remedial massage can be effective during this phase using the following techniques; myofascial release, range of motion exercises and gentle mobilisations. Taping maybe also be helpful. During the rehabilitation phase – a combination of myofascial release massage, regular stretches, range of motion exercises and gentle mobilisations will assist the patient to regain normal spine function. If the disc injury was brought about by repeated micro trauma, it’s essential that the patient addresses any postural problems, muscle imbalances and lifestyle habits through the help of a massage therapist, physiotherapist or doctor.